Children’s Tumbling was founded in 1978 and continues to provide a unique, extracurricular gymnastics program for children of all abilities from age 16 months. Classes are offered in a comfortable and safe Lower Manhattan studio. Children’s Tumbling is distinguished from more traditional gymnastics programs by its innovative, integrated and non-competitive approach to movement, which incorporates music, storytelling and each student’s imagination. 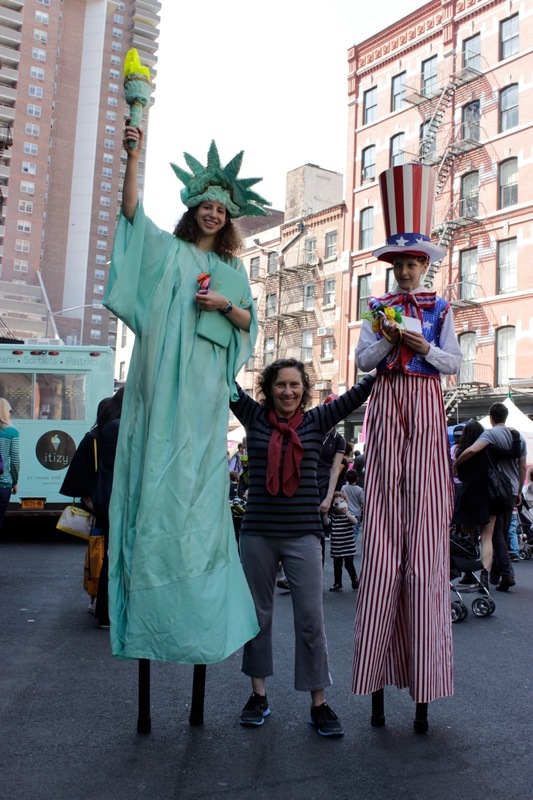 Children’s Tumbling is also an active participant in the Downtown/Tribeca community, engaging in community events ranging from halloween parties to anti-noise pollution rallies. Through out the year the stiltwalking students participate as volunteers in various street fairs in lower manhattan; The Tribeca Film Festival Family Fair, the Washington Market Park’s Halloween Parade, Elizabeth Glaser Pediatric AIDS Foundation’s “Kids for Kids” carnival, The New American Youth Ballet’s Nutcracker performance and all outdoor performances of the TriBattery Pops, Lower Manhattan’s volunteer community band. Suellen Epstein, CMA, as a principal member of the Multigravitational Aerodance Group in the 1970’s, performed and taught master classes in festivals, universities, and museums, in the U.S. and abroad. She designed and taught dance classes for children at a Brooklyn Museum summer program, for six years taught gymnastics at Little Red School House, and was for several years a guest teacher at The British Center School in Venice, Italy. Her early dance training began in the 1970’s at Dance Theater Workshop and the Louis-Nikolais Dance Theater Lab. She studied gymnastics dance for many years with Toby Towson. She continues to attend the workshops of Bonnie Bainbridge Cohen, Irene Dowd and Yamuna Zake when time permits, and studies Zena Rommett Floor Barre technique with Jodi Moccia. As a volunteer she has designed and directed a day of activity for “Rainbow Day” since it’s inception at the St. Vincent Hospital’s Pediatric Psychiatric ward. Washington Market Park's Annual Halloween Parade, 10-28 at 1 PM. Children's Tumbling Stilt-walkers will be leading the band, http://www.lgbac.org , and the crowd, safely to the park Entrance! We'll be there with stilt-walkers to celebrate! 10 years ago: At an Aug. 6, 2008 rally in front of 75 Morton St. Advocating for more downtown schools. Now: We will be at 75 Morton Street again on Sept. 30, 2018 to celebrate the new schools. Study diligently; add physical skills too. Join us and find out why Children's Tumbling has been a downtown institution for decades. Copyright © 2018 Children's Tumbling All Rights Reserved. Please visit the classes page to view the newly posted Fall schedule.